Throughout history, sports have been a way for people to come together, celebrate and take pride in the achievements of communities of all kinds. They engage our bodies, minds, competitive and collaborative spirits. But while they often appear to be the purest of diversions, sports invariably play within and with social structures, sometimes obscuring them through spectacle, and at others calling them into sharp relief. 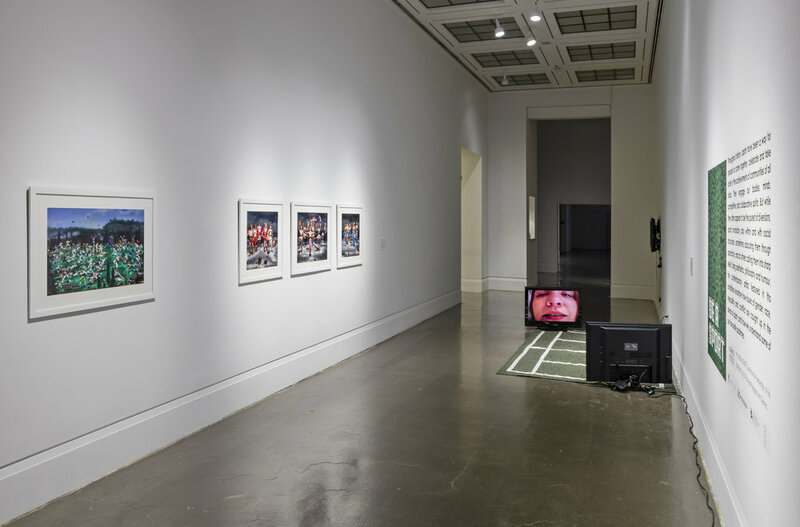 The contemporary artists featured in this exhibition address issues of gender, race, inequality and conflict, and how they are caught up in the arena of sport, using aesthetics, philosophy and humour to play with how we understand some of our favourite pastimes. publications page and in gallery. Be A Sport, Robert Freeman Gallery, Art Gallery of Mississauga. Photo by Toni Hafkenscheid. Hudson Christie, Track and Field, Meeting, 2014, Insulation Board, wood, canvas, vinyl grass, acrylic paint. Robert Freeman Gallery, Art Gallery of Mississauga. Photo by Toni Hafkenscheid. 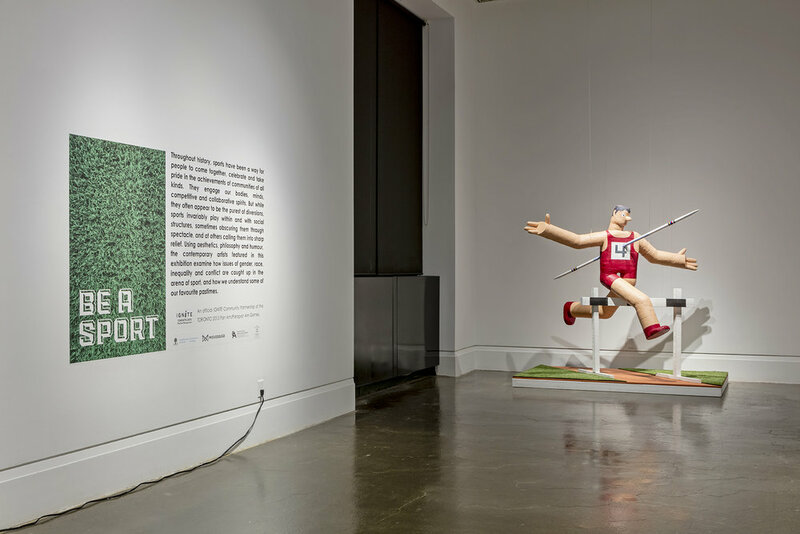 Be A Sport, Robert Freeman Gallery, Art Gallery of Mississauga. Left: Diana Thorneycroft, The Battle of Queenston Heights..., 2013, NRA Sponsored Rhythmic Gymnastics Competition..., 2012. C-prints. Right: Weber & Schneider, Wimbledom, 2000, Textile sculpture, two-channel video. Photo by Toni Hafkenscheid. Weber & Schneider (Sonya Horn and Tina Schneider), Wimbledom, 2000, Textile sculpture, two-channel video. Robert Freeman Gallery, Art Gallery of Mississauga. Photo by Toni Hafkenscheid. Be A Sport, Main Gallery, Art Gallery of Mississauga. Left: Leah Modigliani, The Great One (exterior), 2002 - 2008, Installation. Right: Lia Darjes, Nevine, Jackline, Rayane, Esraa, 2013, C-prints. Photo by Toni Hafkenscheid. Leah Modigliani, The Great One (exterior), 2002 - 2008, Installation. Main Gallery. Art Gallery of Mississauga. Photo by Toni Hafkenscheid. Leah Modigliani, The Great One (interior), 2002 - 2008. Main Gallery. Art Gallery of Mississauga. Photo by Toni Hafkenscheid. Be A Sport, Robert Freeman Gallery, Art Gallery of Mississauga. Left: JEFF&GORDON, How You Play the Game, 2011, Single channel projection. Right: Mark Losier, The Defender Telegraph Series, 2010, Newsprint, matte board, wood frame, video monitor. Photo by Toni Hafkenscheid.